Jesse teaches a breath centric yoga class that focuses on re-balancing the body. 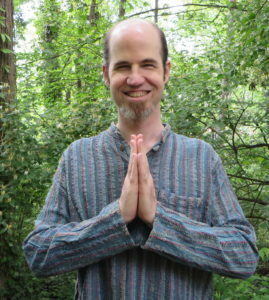 He uses dynamic (moving) yoga poses to help the body regain symmetry. As Jesse went through his yoga training he became passionate about how breath and movement work together to bring harmony and healing to the body. He continues to study the Viniyoga teachings handed down from Krishnamacharya through his son Desikachar and to Gary Kraftsow and other teachers. Jesse is happy to work in class and individually to allow students to fully experience the transformational aspects of yoga. If you are seeking to restore symmetry in the body in an effort to move through life feeling less bound by your own physicality, this is the class for you. Come join Jesse at Breezeway and begin a journey to a higher quality of life through movement.